A squeaky floor is easier to fix if it’s a floor that you can access from below. Have a friend walk above you and knock on the floor when they’ve hit the squeak so you know where to look. If the subfloor and joists are rubbing, you can squeeze construction adhesive into the joint and either install metal hold-down brackets or drive drywall screws diagonally to pull the joist and subfloor together. You can also shim the gap with a very thin glue-coated shingle, being careful not to drive the shim too far and create more gaps. 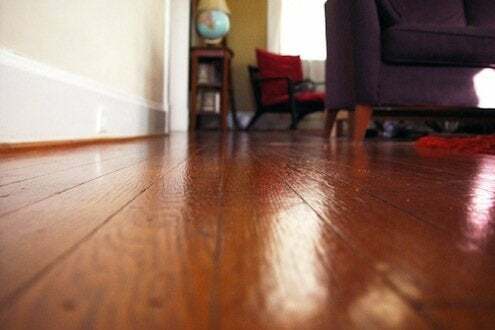 If the squeak is being caused by wood strip flooring rubbing on the subfloor, you can drive screws directly up through the subfloor to close the gap. You may need to drive several to get the right spot. Squeaks in floors that you can’t access from below can also be dealt with, but it’s a little harder to hide your work. For carpeted floors directly over plywood where you don’t need to worry about damaging hardwood flooring underneath, snap-off screw systems work well. Some kits come with a special joist locator screw you can use right through the carpet.